When you are on a camping trip or even just entertaining outdoors, deciding what to do with food and beverage can be a problem. If bowls of food or beverage glasses are set on the ground they are susceptible to whatever bugs and insects may be crawling around. Not to mention there is a high potential of them being knocked over. It can prove to be a nuisance if you end up constantly holding your food or beverage in your hands. 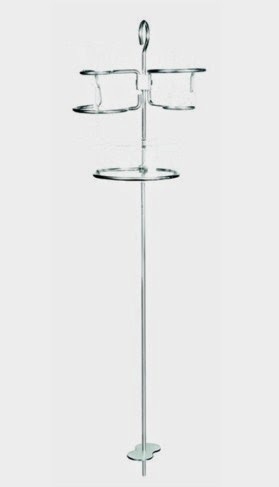 The Camco Tipsy Stix Beverage and Bowl Holder solves this issue by giving you a place to set bowls or glasses high enough off the ground. The Camco Tipsy Stix Beverage Holder has three sections that can hold two different beverages as well as a snack bowl. Your snacks or drinks are kept at a high level from the ground, but still places them within easy reach. The two beverage holders are able to accommodate almost any type of glass, from large drink cups to wine glasses. Using this beverage holder saves you from having to constantly hold onto your drinks and reduces the risk of anything getting spilled. The beverage holder stakes into the ground and features a base plate to keep it steady. It is made from carbon plated steel, and the holders can be mounted two different ways to suit your needs. 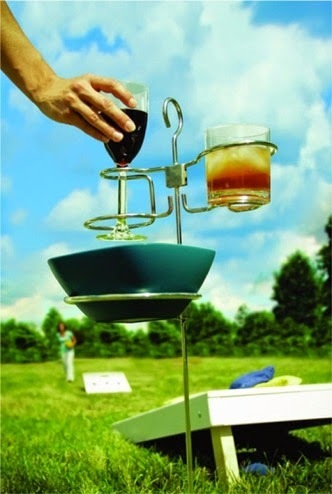 During your next camping trip, barbeque or picnic, the Camco Tipsy Stix Beverage and Bowl Holder will make eating and drinking outside much easier. Keeping snacks or drinks off the ground is also especially helpful when there are children and pets around. Using the Camco Tipsy Stix proves to be a much better solution than setting things on the ground or keeping them in your hands.